Target region of the 60-beam Omega laser at UR’s Laboratory for Laser Energetics. At UR we conduct research in a broad range of experimental and theoretical physics, including astronomy and astrophysics; biological physics; complex networks and data science; condensed-matter physics; elementary-particle physics and cosmology; optical physics, including quantum optics; and plasma and high-energy-density physics. This research is hosted in several departments, including Physics and Astronomy; the Institute of Optics; Earth and Environmental Science; Mechanical Engineering; Electrical Engineering and Computer Science; and Chemistry. 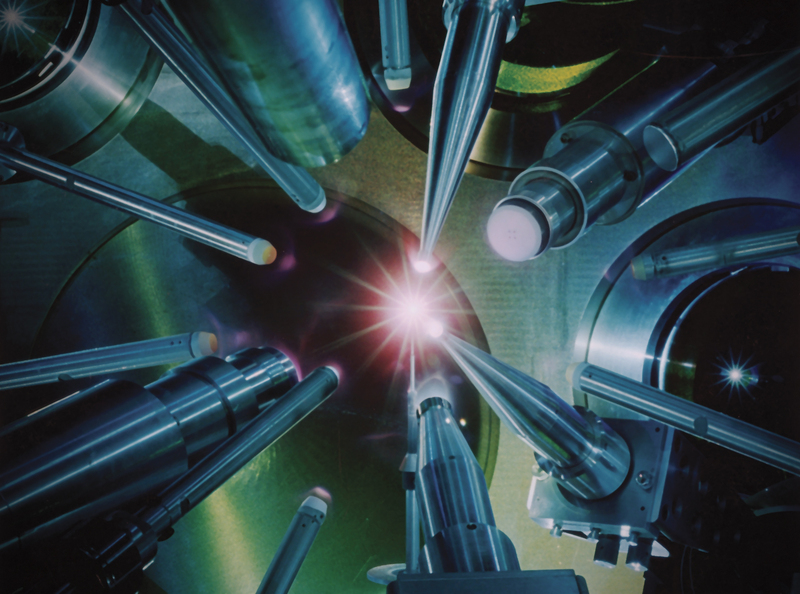 It also prominently involves the Laboratory for Laser Energetics, one of the nation’s premiere facilities for high-energy-density physics, laser physics, and inertial-confinement fusion. We aim for diverse groups of student researchers, in whose mentorship we are assisted by UR’s David T. Kearns Center. Students work for 10 weeks, beginning the first week of June. Their research projects are carried out under the mentorship of UR faculty, with the assistance of postdocs, graduate students, and other undergraduate researchers. CAMPARE students are integrated into a large community of undergraduate physics and astronomy researchers on the UR campus. They attend weekly meetings of all of these students. There, students will be presented with seminars from faculty on frontier research in physics and astronomy, and enrichment in such topics as responsible conduct of research, grad-school and fellowship application, and the preparation of scientific publications. The tenth week ends with a symposium, attended by all the students and mentors, in which each student presents their summer research results. Participants receive a stipend of $5,000 for the 10-week program. They are also provided travel expenses to and from Rochester; housing in an on-campus residence hall with other undergraduate research students; and supplemental compensation for meals and incidentals for those living on campus. 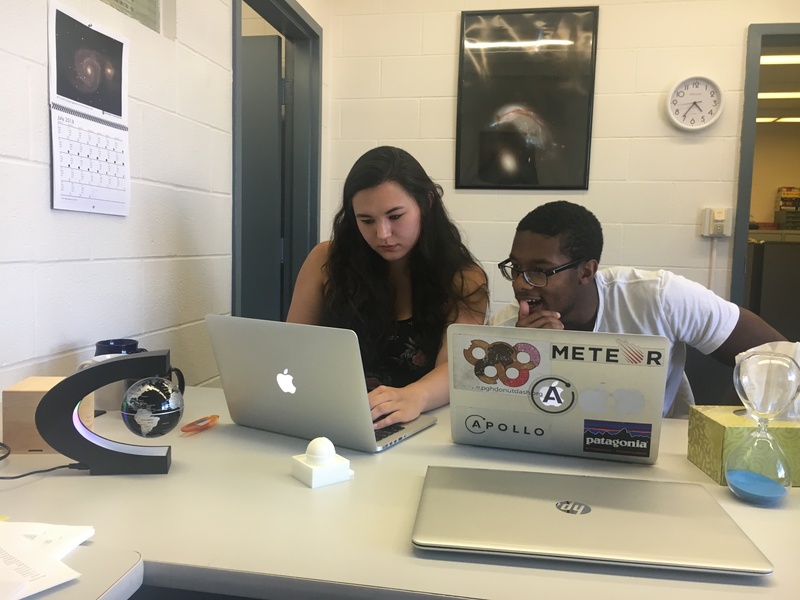 After the summer program, CAMPARE students will be offered the opportunity to present their research at a professional conference, such as the meetings of the American Physical Society or the American Astronomical Society, or the National Conference on Undergraduate Research. 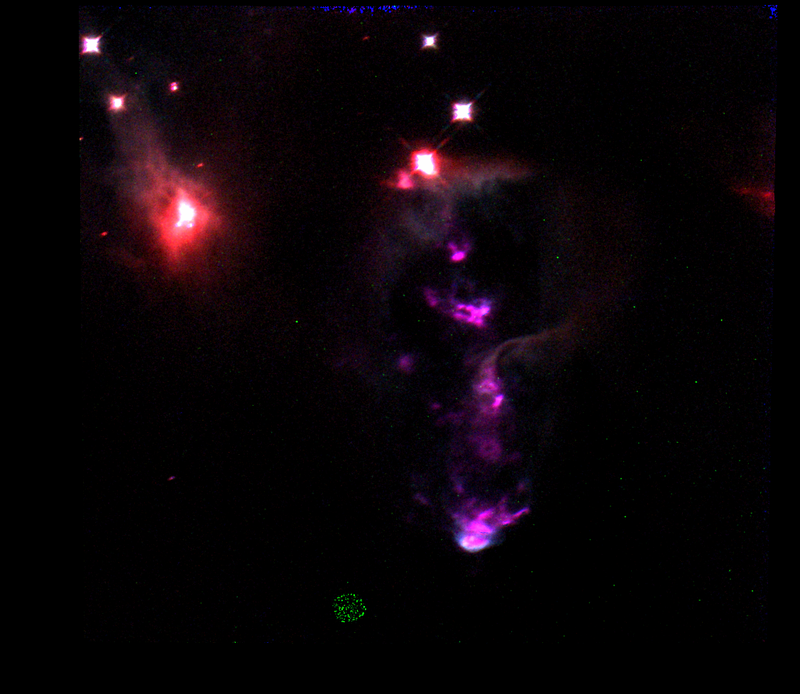 Left image: a three-spectral-line Hubble Space Telescope image of protostellar outflow HH 7-11 in Perseus, from among results of a 2018 summer project by undergraduate researchers Natalie Allen (UR) and Fred Dauphin (CMU) at bottom right. Applicants must be at least 18 years of age by the beginning of the program. They must be enrolled in one of the CAMPARE participating institutions at the time of their application. Participants should not have graduated from their four-year institution before the beginning of the summer internship. Community college students in the process of transferring to a four-year institution are eligible to apply. All applicants must have completed a minimum of one full year of college-level physics and mathematics by the start of the program. Experience in computer programming is a plus. In addition, each applicant must request confidential reference letters from two faculty members, employers, or supervisors, who are familiar with the applicant’s abilities, interests and motivation toward research. Reference letters should be submitted by theirs authors, using the link on the application instructions page. Applicants should indicate the names, addresses, phone numbers, and e-mail addresses of their references in their on-line application. Successful applicants will be notified in March. The 2019 UR CAMPARE program will run from May 28, 2019 through August 2, 2019. Participants must be available for the program’s entire ten-week duration.